Summary: The village people living along the Pacific Coast didn’t like the eagles that swooped from the sky and snatched fish from the waters, but Eagle Boy, an orphan who loved to watch the eagles, always shared his fish with them. One year when fish became scarce, the people had to move their village and left Eagle Boy behind. The eagles remembered his generosity and brought him more food than he could eat. Eventually, Eagle Boy saves the village from starvation. Why do you think the story is called Eagle Boy? What do we know about eagles? Have you ever fed a wild animal? Why are we not to feed animals in the wild? Why was the young man called “Eagle Boy”? The villagers called the young man “Eagle Boy” because he liked to feed the eagles with the fish that he had caught. Why was Eagle Boy criticized for feeding eagles? The villagers did not view the eagles as friends. Why was Eagle Boy left behind? There was no room in the boat. How did Eagle Boy honour the eagles who fed him? He built a large fire and danced. What did Eagle Boy need to ignore and forgive in order to help his people? He had to ignore his hurt for having been left behind and forgive the villagers in order to save them from starvation. Who understood the sign that the tribe had been forgiven and could return back to the village? Chuh-coo-duh-bee understood that when the eagles returned with food they had been forgiven. Why was Chuh-coo-duh-bee a better partner for Eagle Boy rather than Kwish-kwish-ee? They respected one another and valued their friendship with the eagles. 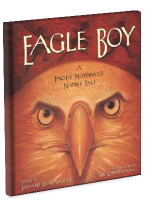 Discuss with students how Eagle Boy’s song may have sounded in the story and brainstorm words he may have used. Distribute the Write A Song handout to students and have them write lyrics to a song that thanks the eagles for the food. Despite the hardship that Eagle Boy and the villagers faced, there were many acts of kindness in the story. Distribute the Kindness handout to students and have them describe the kindness encountered in each part of the story.